I’m quite certain this is probably some GIF that was going around the internet at some point but all I know is that I happened to have missed it. So just in case any of you out there didn’t get a chance to see it, here it is! This is part of some TV skit from a small show that the Jackson 5 had back in the 70s and needless to say the 3 or 4 seconds edited to make this GIF are pretty weird/funny. Also, this is in no way me ranting on Michael Jackson or anything like that. It’s just a wacky GIF I wanted to share. Myth: Living in a metropolis means your cycling adventures consist of being trapped inside the stifling four walls of a gym with a techno-music loving spin instructor. Fact: There's no reason to go stir-crazy or spend the majority of your bike rides dodging cars. Major cities such as Boston and Atlanta have combined fitness with nature in the form of urban biking trails — perfect for connecting with the great outdoors while never leaving the comfort of the cityscape. "Cycling is a great option for aerobic/cardio-respiratory exercise because it is low-impact, unlike running which can be painful for the knees, hips and lower-back," says Pete McCall, exercise physiologist and spokesperson for the American Council on Exercise. Whether you're a biking beginner or a Lance Armstrong-in-training, here's a breakdown of the top urban bike paths that will leave you breathless — for more than one reason. Admit it, the daily gridlock of the big city has really tamed your inner Paul Bunyan. Thankfully, just about 14 miles northwest of Atlanta, Georgia, lies 61.5 paved miles of scenic, woodsy bliss. The Silver Comet Trail begins in Smyrna, Georgia and runs all the way to the Alabama border where it meets the Chief Ladiga Trail. Built over an abandoned rail line, the trail is relatively flat, with a few medium hills at mile marker 19.4 and 36 and steep hills near the end of the path at mile marker 45.8 and 51.4. So while you can brag to your coworkers on Monday about the scenic trip you took through Georgia's countryside that had you biking over rushing creeks, winding between rock cliffs and pedaling through railroad tunnels, you can leave out the fact that the trail is extremely user-friendly with plenty of access to rest stops and bathrooms. Frankie's Italian Restaurant near the Rockmart Trailhead at mile marker 37.6 caters to cyclists and next to Coot's Lake Trailhead at mile marker 33.5 is Coot's Lake Beach which has public swimming and a picnic area for a small entry fee. The bicyclists are coming! The bicyclists are coming! The Minuteman Bikeway's level terrain is both scenic and historic — the trail closely approximates the route Paul Revere took on his famous ride in 1775, announcing the incursion by British forces. The 11-mile paved trail connecting Bedford to Cambridge passes through Lexington and Arlington, with plenty of open spaces — perfect for relaxing, playing ball and hiking along the way. The Alewife Brooke Reservation at the end of the bike path in Arlington boasts playing fields and bird watching, and in East Lexington is the 183-acre Great Meadows. Also adjacent to the bike path is Spy Pond, which has a boat ramp and picnic tables. Be forewarned that the Minuteman Bikeway can become crowded so try to keep your bike rage to a minimum and consider crowd-dodging an extra workout. With "lakefront" in the trail's name you know this bike path is on some prime real estate — and what's more scenic than rolling along the edge of Lake Michigan? With the shoreline on one side and a view of the city skyline behind you, Chicago's Lakefront Bike Path is the picturesque urban biker's dream. The 18.5 asphalt miles between Rogers Park and the South Shore Cultural Center includes the Shedd Aquarium and the Navy Pier where you can rent bikes as well as check out Pier Park's Ferris wheel and miniature golf course. But if your bike rides are strictly for fitness, you can easily turn the bike ride into a whole day of physical activities thanks to the volleyball courts, playgrounds, baseball diamonds, tennis courts and soccer fields found along the path. For nature-lovers, there is more to metro D.C. than just the cherry blossoms. Steal a glimpse (away from the crowds) of some of the capital's favorite monuments while enjoying the serenity of biking along the Potomac River. Located across the river from downtown Washington D.C. the trail extends 18.5 miles from near Theodore Roosevelt Island to Mount Vernon, along the Potomac River. Start with a warm-up walk at Theodore Roosevelt Island where you'll find two and a half miles of nature trails and breathtaking views of the nation's capital. Back on the trail, you'll see the historic Arlington Memorial Bridge, which symbolizes the strength of the post-Civil War united nation, as well as the Navy-Marine Memorial and Jones Point Lighthouse. The paved trail is fairly flat with an occasional rolling hill but make sure to save some energy for the end — the last mile heading towards Mount Vernon has a decent climb. Stop at Gravelly Point (between mile three and four) for a panorama view of Washington, the Potomac River and Washington National Airport. Home to glitzy Los Angeles and scenic national parks it can be hard to stand out in California; but the 32-mile Jedediah Smith Memorial Trail/American River Parkway accomplishes just that. Dubbed the "Jewel of Sacramento," the paved asphalt bike path that runs between Old Sacramento and Beal's Point at Folsom Lake transports cyclists from the chaotic lifestyle of urban California (and far away for the Los Angeles smog) to a biker's oasis. The mostly flat route travels along the American River and has a top elevation of about 450 feet. The trail is home to Run the River — Sierra-Cascade Adventure Racing Sport's half, full and ultra marathon. Along the trail you'll pass Discovery Park, the 302-acre park in downtown Sacramento where the American River meets the Sacramento River as well as Guy West Bridge (a pedestrian bridge replication of the Golden Gate Bridge) and C.M. Goethe Park. TOKYO (May 16) -- Almost everyone stood when the bride walked down the aisle in her white gown, but not the wedding conductor, because she was bolted to her chair. The nuptials at this ceremony were led by "I-Fairy," a 4-foot tall seated robot with flashing eyes and plastic pigtails. Sunday's wedding was the first time a marriage had been led by a robot, according to manufacturer Kokoro Co.
"Please lift the bride's veil," the robot said in a tinny voice, waving its arms in the air as the newlyweds kissed in front of about 50 guests. The wedding took place at a restaurant in Hibiya Park in central Tokyo, where the I-Fairy wore a wreath of flowers and directed a rooftop ceremony. Wires led out from beneath it to a black curtain a few feet away, where a man crouched and clicked commands into a computer. Japan has one of the most advanced robotics industries in the world, with the government actively supporting the field for future growth. Industrial models in factories are now standard, but recently Japanese companies are making a push to inject robots into everyday life. Honda makes a walking child-shaped robot, and other firms have developed them to entertain the elderly or play baseball. Kokoro, whose corporate goal is to "touch the hearts of the people," also makes giant dinosaur robots for exhibitions and lifelike android models that can smile and laugh. The company is a subsidiary of Sanrio Co., which owns the rights to Hello Kitty and other Japanese characters. "This was a lot of fun. I think that Japanese have a strong sense that robots are our friends. Those in the robot industry mostly understand this, but people mainly want robots near them that serve some purpose," said bride Satoko Inoue, 36, who works at manufacturer Kokoro. "It would be nice if the robot was a bit more clever, but she is very good at expressing herself," said new husband Tomohiro Shibata, 42, a professor of robotics at the Nara Institute of Science and Technology in central Japan. The I-Fairy sells for about 6.3 million yen ($68,000) and three are in use in Singapore, the U.S. and Japan, according to company spokeswoman Kayako Kido. It has 18 degrees of motion in its arms, and mainly repeats preprogrammed movements and sounds. Copyright 2010 The Associated Press. The information contained in the AP news report may not be published, broadcast, rewritten or otherwise distributed without the prior written authority of The Associated Press. Active hyperlinks have been inserted by AOL. So, did you watch the Miss USA competition? Of course you didn’t, that’s our job. And so, we’re happy to present to you Dearborn, Michigan resident and your new Miss USA 2010, Rima Fakih. Check out some pictures below. Concerned about the security of your personal information on the internet? We all are, and thanks to Mark Zuckerberg, we’re more concerned than ever before. While having your Facebook profile show up in search engines for anyone talented enough to Google your name may be worrisome, it’s far from the worst case scenario. What if there was a website that pulled data from all of your social networking profiles, from Twitter to Flickr, and put it on display for anyone with curious eyes to see? I hate to break it to you, but there is… introducing… Spokeo! Founded by a team of Stanford alumni in 2006, Spokeo didn’t start out pure evil. The original vision for Spokeo.com was to be a social networking aggregator, a la FriendFeed. This would allow their users to follow their friends, family, and colleagues across several social networking platforms. Nothing wrong with that, right? Well, Spokeo’s alarming business model began to unveil shortly thereafter. Redesigning their site in 2008, Spokeo made it possible for users to import their e-mail contacts and create friend lists. At this point, it became apparent that Spokeo had more information on you than you may be comfortable with, including LinkedIn profiles, Picasa photos, and personal blog posts. This year, Spokeo revamped their site once again, transforming into the all-knowing, data-hungry monster it is today. Type in a name, any name, and if you’re feeling specific feel free to narrow your search by adding in a city and state. Spokeo will then pull data from its massive scraped database of personal information and provide you with every detail you did, or didn’t want to know about that person’s life. Now, if you’re skeptical, you may think that this isn’t as bad as it seems — who cares if someone can search information that people have knowingly and willingly made available across social networking websites, right? Sure, that’s a valid argument, but (and this is a big BUT) it doesn’t stop at social networking sites. Spokeo collects information not only from online profiles, but also from government censuses, property listings, and business websites. Sure, this information is all publically accessible, but did you really fill out your census assuming that your answers would be easily searchable on the internet? The real concern here lies in the fact that all of this information is taken from different sources, stacked together, and readily displayed for the average (or not so average) person to find. What Information Does Spokeo Provide? So what information, exactly, does Spokeo have on you? You may not want to know the answer. Let’s start with a rundown of the “basic profile” information: name, address, phone number, age, gender, ethnicity, zodiac sign, relationship, children, occupation, education level, hobbies, and home ownership status. Moving on, anyone who looks you up will be provided with a list of your personal interests and hobbies that include: which sports you play, what kind of books you read, your taste in music, personality traits, what type of automobiles you prefer, and what type of investments you research. Oh, and that’s just the beginning. Searchers are then given a breakdown of your household and the people living in it. How many people are living there? What type of home do you live in? Do you have children? A fireplace? A swimming pool? How long have you been living there? What kind of neighborhood do you live in? Most importantly, how much is your home worth? For a measly $4.95 per month, potential stalkers, convicted felons, and bitter ex-lovers can get a bit more information on you. That is, if they’re crazy enough to provide this data devouring beast with their credit card information. Fear not, though, logic isn’t among the strongest of traits in the obsessive. So what information is disclosed when you pay off Spokeo? For starters, your “basic profile” will be expanded upon to disclose your religion, political affiliation, birthday, and spoken languages. Moving on to your “wealth” info, Spokeo provides anyone willing to pay 5 bucks with your estimated income, investments, and mortgage value. What a steal! Next up, your average psychopath can get expanded information on your “lifestyle indicators.” I can only imagine what kind of info lies behind closed gates. Last, but certainly not least, a paid-membership to Spokeo provides customers with detailed (“full,” as they describe it) household information. Considering the fact that the standard household info contains the number of people living in your home, whether or not your house has a fireplace, central air/heating, and/or a swimming pool, you can only imagine what information 5 dollars will get you. Blueprints of your home? A live webcam feed of your living room? Probably lots of cool stuff that any web-savvy burglar would like to know. Oh, and let’s not forget that your basic household information indicates whether or not you have children. It can only be assumed that paying customers will be given a few more details on that aspect of your life. With all of the data Spokeo has racked up, I’d hope that they at least do a criminal background check before giving anyone with internet access and a credit card such information. My guess, however, is that they don’t. Now, you may be curious about the accuracy of the data and personal information that Spokeo has on file. Without question, the data available at this time is far from “perfect.” Keep in mind, though, Spokeo’s new, enhanced version just launched a couple of months back. Address & Phone Number: The addresses and phone numbers they have listed are very accurate, not surprising as they are pulled from the phone book. Photos: The photos given are not accurate in the slightest, I have no idea where these (seemingly random) photos are coming from. Basic Profile: Info in the basic profile information is, for the most part, accurate. The exception here is estimated home value (no, my home is not worth over a million dollars, unfortunately). Lifestyle & Interests: The lifestyle and interests section is somewhat accurate, I’d say around 50 percent of what they have listed on there is correct (yes, I own dogs; no, I don’t enjoy knitting). Household: The names and ages of household members are accurate, as well as the home description and length of residence. The estimated home value, again, is off. Neighborhood: Containing median income, home value, as well as age, ethnicity, and occupation distribution, the neighborhood information looks accurate in general. Not much to add here. Spokeo’s large database of personal information is definitely of concern. While there are several notable inaccuracies in the info they provide at this point, it’s important to recognize that they are just getting started. Without a doubt, Spokeo will do everything in their power to make their information more precise, and more detailed. Obviously, you don’t want random lurkers, criminals, or creeps of other varieties to have easy access to all of your personal info, but you may not want current or potential employers to have it either. Thanks to Spokeo, with as little information as your name, the outcome of your job interview may be predetermined before even stepping foot in the door. These are just some of the potential problems that a website like Spokeo can cause in your life, if you think about it, the list is nearly endless. How do you feel about your personal information being neatly compiled and readily available on the internet? As your Icelandic friends can tell you, volcanoes are nothing to kid around with. They're big, they're filled with molten rock, and, from time to time, they like to show off for the outside world. But you've never let the threat of a little lava stand in the way of a good time. Introducing Volcano Boarding, your chance to take a high-speed slide down the sandy slope of a Nicaraguan rumbler, running now. 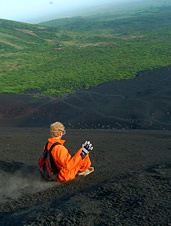 The last eruption was in 1999, disrupting boarding for a solid two days, and there could be another any day now. So you'll want to watch your back—or request a toboggan-style board that'll rocket you down at up to 40 miles an hour. Which we're pretty sure is faster than lava. RJD popularized the "devil's horns" at concerts. Ronnie James Dio, legendary vocalist for Black Sabbath, Heaven & Hell and Dio, has died after a battle with stomach cancer, according to his wife, Wendy Dio. He was 67 years old. The heavy metal singer died early this morning. He was being treated at M.D. Anderson in Houston. A rumor circulated Saturday night on Twitter about Dio's death. His wife quickly shot that down: "He is not doing well, but he is not dead." "Ronnie knew how much he was loved by all. "We so appreciate the love and support that you have all given us. "Please give us a few days of privacy to deal with this terrible loss. "Please know he loved you all and his music will live on forever." "The grand wizard of classic rock" was born in New Hampshire and first burst onto the scene with the band Elf. Dio's last studio work as part of Heaven & Hell, The Devil You Know, was released in 2009. The band was scheduled to tour this summer but canceled all dates in early May.